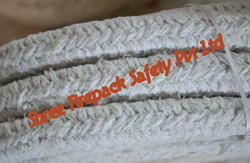 Our range of products include ceramic fiber square rope. shree firepack safety pvt ltd offers ceramic fiber square rope is manufactured from high quality ceramic fiber yarn with alloy wire /inconel wire reinforcement. It is metallic variety ceramic braided square rope available indifferent sizes density. ceramic fiber ropes in square section is strong, light weight highly flexible material manufactured fromcomposition of Alumina, Silica some special additives. The basic raw material used to manufacture ceramic fiber yarn square rope has extremely high temperature resistant property.Metallic reinforcement increase mechanical strength temperature resistant properties of ceramic round rope. Looking for Ceramic Fiber Square Ropes ?